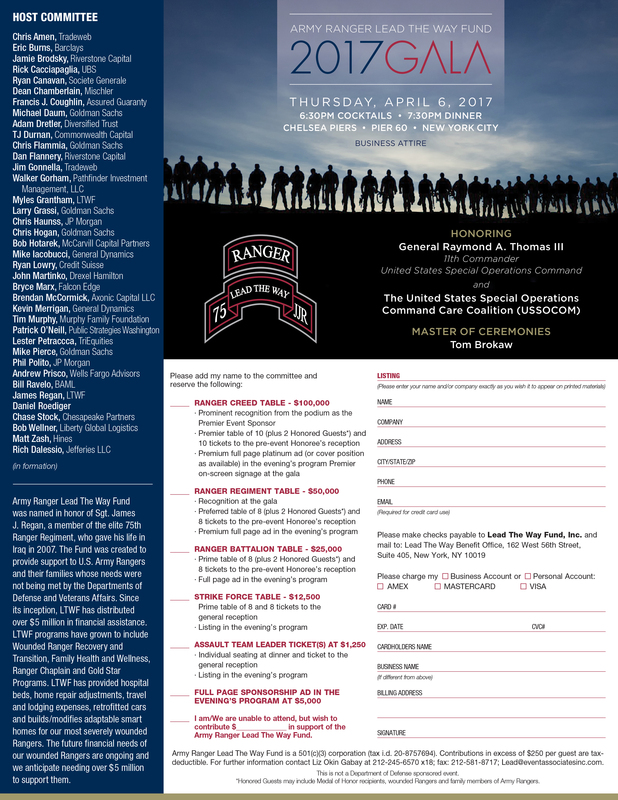 On Thursday, April 6, 2017, Army Ranger Lead The Way Fund will be hosting its 3rd Gala Benefit at Pier Sixty in NYC in support of our wounded and active duty U.S. Army Rangers and their families. We are excited to have Tom Brokaw back again as our Master of Ceremonies as we honor the United States Special Operations Command Warrior Care Program (Care Coalition) with our Sgt. James J. Regan Lifetime Achievement Award. The USSOCOM Warrior Care Program supports Special Operations Forces (SOF) Wounded, Ill, or Injured service members and their families by providing a model advocacy program to enhance and strengthen their quality of life. Our relationship with the Warrior Care Program has been integral to the success of our organization. We are thrilled to tell you that Four Star General Raymond A. Thomas “Tony”, who currently serves as the 11th Commander of U.S. Special Operations Command (USSOCOM), has graciously accepted our invitation to attend as our esteemed guest speaker, helping us to honor Care Coalition.